This might be actual comedic perfection that you are about to witness. Ever since the song "We Didn't Start the Fire" came out, much has been made about how gloriously some people have misunderstood Billy Joel's lyrics. (And before you start, whippersnapper smartasses, we didn't have Google back then so unless you had the lyric sheet from the album, it was pretty much up to you to figure the words out on your own.) The song was both a test of your history knowledge and your ability to decipher musical lyrics. And possibly your hearing in some cases. There's been plenty of comedic examples of this. My favorite is a friend who thought one line was "Roy Cohn, Wapner's On" instead of "Roy Cohn, Juan Peron." Why the hell would I my friend think that in the middle of a song about major historical events and personalities Joel would mention the old host of the People's Court? It doesn't matter now, because this is the bad lyric version of "We Didn't Start the Fire" to end all bad lyric versions of "We Didn't Start the Fire." 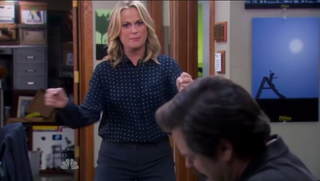 Of course this is what from Parks and Recreation's Leslie Knope thinks the lyrics to this song are. Of course.